The Ninth National Jazz and Blues Festival. Big thanks goes to Kieran McCann for the donation of his collection of cuttings from the local press. Although there is the usual litany of complaints , fears by locals that they will be murdered in their beds and Tory MP's complaining about the noise and drug taking, there are quite a few details about the bands , festival logistics and the sound problems that dogged the first night. Special security force will watch Plumpton Rave. SOLDIERS on leave, and off duty policemen will be among a 2OO strong security force Iaid on by the organizers of the Ninth National Jazz, Blues and Pop Festival, which opens at Plumpton race course tonight. with it," festival publicist Brian Sommerville said today. the area the same number of officers as for Plumpton Races. Hundreds of youngsters camped in tents and in the open air at the racecourse last night. Many from abroad had travelled to this country especially for the three-day festival. There is room for several thousand campers at the racecourse and workmen have laid out a " mini -village " of marquees as well as erecting a giant stage. 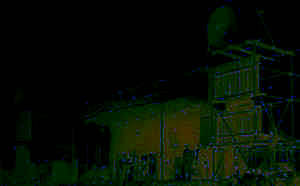 The "village" includes a discotheque. fashion boutiques, record and book shops, a coffee shop, a dairy, a souvenir store and a camping equipment supermarket. If the hot, sunny weather continues the attendance over the weekend could top 60,000. Advance bookings had reached 20,000 last night -the majority from overseas. The festival is one of the most famous in Europe and this is the first time it has been held in Sussex. The festival budget exceeds 15,000 pounds. More than 40 groups, plus leading members of the cast of the musical " Hair. "are appearing . The opening concert at 8pm tonight will feature the Pink. Keith Tippet Jazz Group, Junior's Eyes, and The Village. 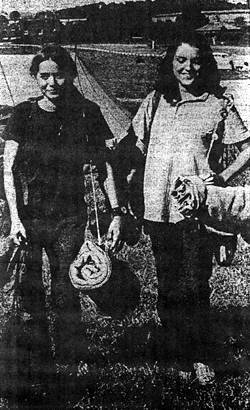 Among the first to bag a plum position on the camping site were two young Dutch nurses, 18 year old Ria Claessen and I6-year old Christine Vamensgast , both from Maastricht. 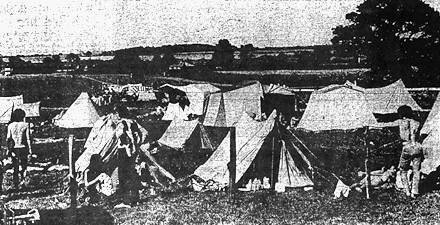 After disembarking at Dover they hitch-hiked to Plumpton and set up to camp there on Monday. They are particularly looking forward to hearing the Bonzo Dog Doodah Band , the Pink Floyd ,the Nice and the Family. Five Swedish students .who arrived at the camping site on Wednesday after coming over to England for the festival brought with them 25 economy size cans of Swedish meatballs.
" We didn't know what the food situation would be. and didn't want to go hungry," said one of them. Bo Svenson. from Korlskrona. The Who were the group that most interested them ," Their records sell very well in Sweden." Bo said. Three German students arrived on Wednesday after being told of the festival in a letter from English pen friends. "We've all seen The Who before, when they came to Germany," said I9-year old Eckhard Dobroschke. "They're very good. We also want to hear the Pink Floyd." Eckhard and his friends come from near Minben. Italy. Many had brought food supplies and primus stoves. Two girls who are certainly a long way from home are Canadian students Elaine Sky and Liz Roach ( photo right ) they have come all the way from Toronto. Both 19 , they're on a hitch-hiking tour of Europe, and have so far taken in France. Belgium , Austria , Italy, Germany, Denmark , Sweden and Finland -not bad going !. They arrived al Plumpton yesterday-with blankets, but no tent. "We're just praying it keeps fine," said Elaine. "We' ll be sleeping in the open and if it rains - -we' ll be drowned" The girls particularly want to see the stars of "Hair"
Scores of youngsters from the Midlands and North of England - are already ensconced in the camping site. "I think there may be rather too many people," said 16 year old Herawood Kay ,from Middlesborough. He was especially looking forward to hearing the Blodwyn Pig . The racecourse had already taken on a festival atmosphere yesterday, as the hundreds of fans sunned themselves on the grass. the boys in trunks and the girls in bikinis, Pop music blared out from transistor radios. A few played their guitars and banjos ,( banjos!) Others played cards, drank cider and cooked spaghetti. Many of the Plumpton villagers view the festival with apprehension. but Brian Sommerville is confident that their fears of rowdyism and vandalism will prove unfounded. "They won't even hear us." he said. "Huge bales of hay are being mounted behind the speakers to contain the noise of the groups." British Rail are laying on special trains over the weekend. Plumpton station is immediately beside the racecourse and tonight shuttle services will run from Lewes and Haywards Heath to Plumpton, arriving in time for the concert. There can be little doubt that the festival will prove to be one of the most sensational events that Sussex has ever seen. Local press accounts day 2. Local Press accounts day 3. You can view many great photos of the acts at Plumpton by visiting the Repfoto site . 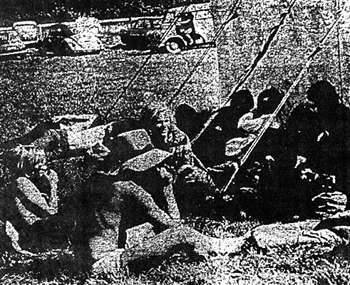 Known recordings of the 1969 Plumpton festival. With set lists and recording details if available.